Rising costs is a challenge being faced by libraries across the country. In Denver, keeping a library safe and warm during the winter can be challenging. As the city continues to expand, Denver’s cost of living is continuing to rise and crime rates are increasing. Libraries have been directly impacted by these issues. That’s why more and more libraries are turning to window film as a solution. 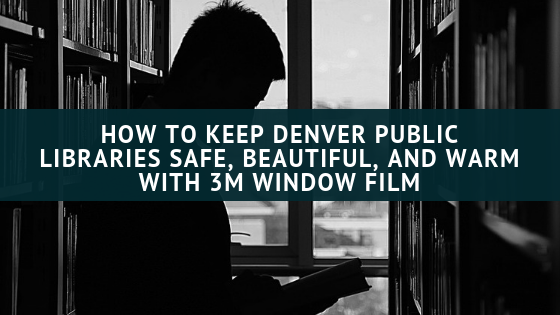 By installing 3M Window Film, Denver libraries can protect their building and the public from crime, theft, and vandalism and save money on energy costs. According to the US Department of Energy, homes and building account for approximately 40% of energy consumed in the US. The average American spends about $2,000 per year on energy and unfortunately much of this expense, approximately 20-30%, goes to waste due to inefficient or outdated materials. During the winter, energy costs tend to rise in Denver because hvac run times are increased by the cold temperatures outside. Heating systems have to stay on longer to reach a desired temperature due to the cold outside temperatures. Heating systems also turn on more frequently when heat is constantly being lost through inefficient windows. By installing energy saving window film, Denver libraries can prevent energy loss and save 15-30% on heating costs. Energy saving window film provides a low-cost solution for fixing insulation issues with windows. It traps heat within a building, making the space inside more comfortable and reducing overall energy consumption. Energy savings aren’t the only way libraries can benefit from window film installation. Specialized types of window film, such as anti-graffiti window film and security window film, can actually deter break-ins and prevent vandalism. Security window films work by increasing the strength and shatter resistant of glass, preventing intruders from entering a building by smashing the windows. Anti-graffiti films are a form of vandalism prevent where a removable film actually works sacrificially by taking the full brunt of the attempted graffiti, protecting the surface underneath. By installing 3M Window Films, Denver libraries can keep their space safe, beautiful, and vandalism-free and save money on energy costs. Green Light Window Films is the leading source for 3M Window Film in the Denver metro area, including the cities of Aurora, Centennial, Thornton, Lakewood, and surrounding area. Call us today to get a quote on window film installation for your library.